You’re in with a chance of spotting the mystical Northern Lights between about September to April – during the darker winter months. Why can’t I see the Northern Lights during the summer in Iceland? The Aurora activity still occurs all year round, but it’s nearly impossible to see in the summer months because the sky is so bright – almost 24-hour sunlight in July! 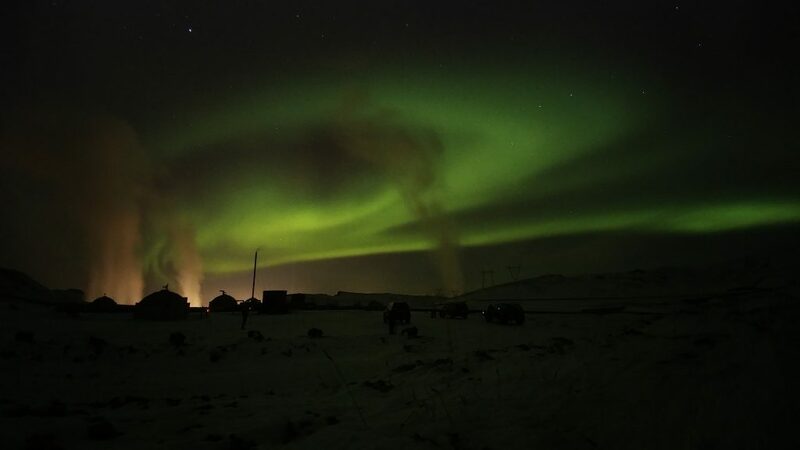 How to increase your chances of seeing the Northern Lights? To increase your chances, download an Aurora forecast app for your smartphone to see how strong the activity is likely to be during your stay and remember to always be looking up at night if the sky is clear! If there’s a good Northern Lights forecast, check the weather and see how clear it’s going to be. If you’re in luck with a clear sky and good Aurora activity forecast then you’re in with a great chance. Even with a great Aurora forecast and no cloud cover, you might still be hindered by the light pollution of Reykjavik or the town you’re in – getting out of the city lights will give you the best chances of seeing the Northern Lights, although I have been lucky enough to see amazing Northern Lights displays right over the city. 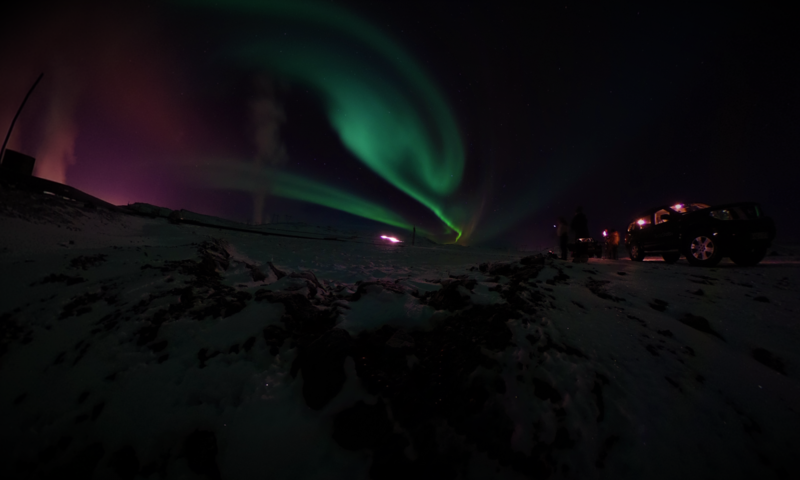 You will need a stable camera with manual controls to give you the best chance to capture the Aurora Borealis. Being able to photograph with a slow shutter speed and/or a high ISO exposure means it’s usually possible to see the Northern Lights on your camera in a photograph before it’s visible to the human eye. Is it possible to photograph the Northern Lights on my phone? Yes, if you have a newer smartphone that gives manual controls. Maybe, if you don’t, but you happen to get lucky with a bright Aurora display and can keep the camera still. I have managed to snap some great shots even using the manual controls on my Android smartphone, but a dedicated camera with a larger sensor is always going to give better results. I actually forgot my main camera on one trip but managed to snap some half decent shots using a 30 second shutter speed, ISO-200 on my LG v20 Android phone and 2 second timer with it mounted on a small Gorillapod tripod to keep it still. Seems obvious, but make sure your camera or phone is set to the highest image resolution possible to achieve the best results. If you have a 24 mega pixel camera, but you’re only shooting at 12 mega pixels, you’re missing out on a lot of extra detail. Use a camera timer, or remote trigger whilst you have your camera in a stationary place – resting on a rock, or ideally on a tripod – that way you won’t blur the shot by pressing the shutter button. You’ll want to switch to manual and experiment with a slow shutter speed of anywhere between 2 seconds up to 30 seconds or even 1 minute depending on how bright the lights are. Adjust the ISO – camera exposure according to how long your shutter is staying open, the lower you can keep your ISO the less grain and noise you will have in your image. But the longer the shutter speed the more the movement of the Northern Lights will be blurred in each shot, so experiment with a shorter shutter speed and high ISO and then longer shutter speed with a low ISO to see which settings achieve the best results for your camera in the conditions you’re in. Obviously, the wider your aperture, the more light your camera lets in to the sensor. So the lower the f. stop number, the better chance you’ll have of capturing the Northern Lights in your photos. Do some test shots and zoom in on your captured shots to double check everything is correctly in focus. How can I capture the Northern Lights on video? With current technology, this is extremely difficult on a smartphone unfortunately due to the small camera sensor size not allowing enough light in and not being able to increase the exposure as much as on a higher end camera. However, if you have a camera that allows manual video controls, you might be in with a chance. If you have a 4K or higher camera, USE IT! There will be so much extra detail captured at 4K over regular HD, so set it as high as possible. You will need to set your shutter speed for the video as low as possible – 24 frames per second if your camera can shoot at 24fps. You could go lower, but if shooting handheld your video will be extremely blurry, experiment at your own peril. Crank your ISO exposure up as high as it will possibly go to try and see the Northern Lights in video capture as it’s happening. But remember, the higher the ISO, the more grain and noise your video will have, so start as high as possible and dial it down, if you can, to an acceptable level. 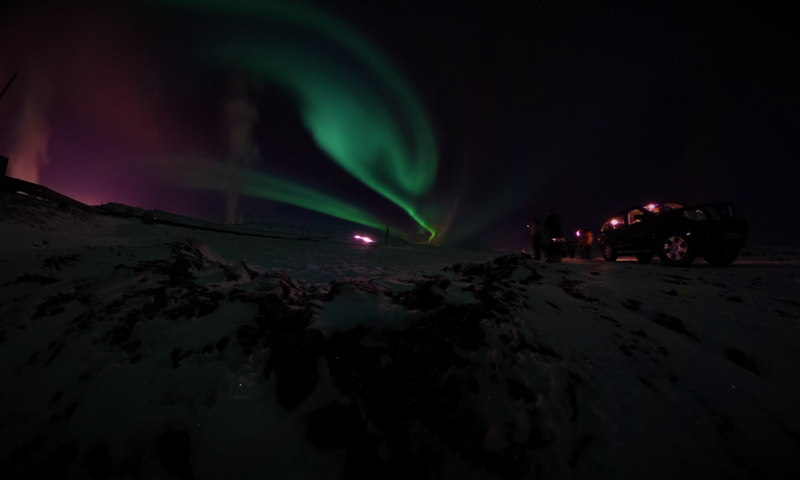 If you’re shooting on an amazing low-light capable camera such as a Sony A7S II – then you can comfortably capture the Northern Lights in stunning quality with minimal noise. However, if you don’t have such equipment at hand, it might still be possible, but your results probably won’t be cinema quality. I was able to video the Aurora Borealis on my Sony RX100 IV point and shoot camera, by switching to full manual, setting the ISO all the way up to 12,800 and using a frame rate of 25 fps. The resulting videos were indeed noisy, but it was nice to be able to capture the memory. Make sure you use manual focus so you can focus to infinity and ensure you don’t end up with loads of out of focus footage, like I did first time round on auto focus. but with a fast aperture (a low f. stop number). If you’re a photographer, I highly recommend booking a tour with Arctic Shots who will take you out on the best night, checking cloud coverage and try take you to a great spot for taking beautiful photos as well as be able to help with tripod hire and tips for photographing the Aurora.